There are some dishes that brings you back to a time and place instantly. For me this recipe always brings me back to memories of my first apartment and fending for myself for the first time. Living on a budget, I was after a recipe that can use any cheap ingredients I can get my hands on without being too challenging. Luckily this recipe has two key cheap ingredients: the first being a bag of ripe tomatoes going cheap at the local grocer and the second a stale loaf of bread. It wasn’t until much later that I realised this recipe is based on a Tuscan dish called Pappa al Pomodoro, a popular summer dish. 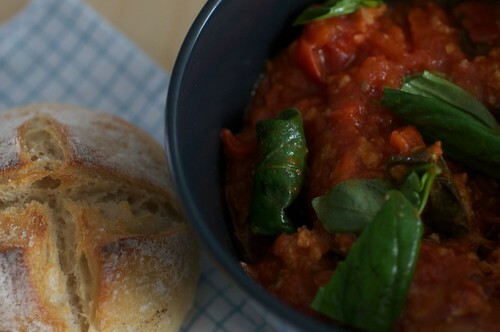 As a tip this recipe is best made during summer when tomatoes are plentiful and at its juiciest. To peel the tomatoes, score a cross on the skin on the base and place in a large saucepan of hot water, leaving them there until the skin starts to peel. Dran and peel. Place the oil and garlic in a large saucepan over medium heat and cook for 1 minute. Add the tomatoes and simmer for 30 minutes.Stir the tomatoes occasionally to break them up. Don’t try to cheat by adding tomato puree or canned tomatoes, you immediately lose the natural lightness of fresh tomatoes. Add the bread, stock, basil and sugar to the tomatoes and allow to stand for 5 minutes. To serve, ladle the soup into bowls, drizzle with extra olive oil and sprinkle plenty of cracked pepper. Serves 4-6. You can sprinkle parmesan on top, but I rather like it without.